Laser modules have to fulfill special requirements in industrial image processing. Line lasers with a homogeneous power distribution are generally used in metrology, but high-power laser designs and special housings are also in demand in industrial image processing. The Workhorse – the standard image processing laser for the majority of applications. 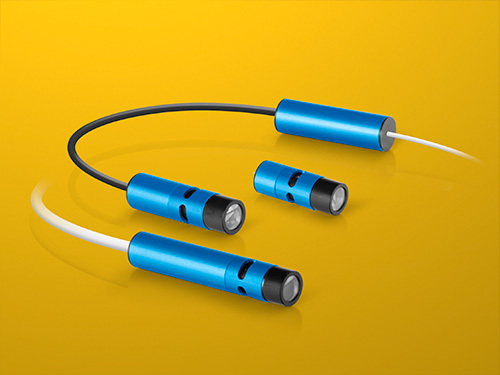 With a housing of 61 mm x 11.5 mm, the FLEXPOINT® MVnano lasers are suited as stand-alone products or for integration in very different applications. The focusing mechanism was fundamentally reworked in the 2017 edition to make it possible to more quickly and accurately adjust the focal distance. There are several optics available for selection that offer the best ratio between line thickness and depth of focus for each application. The MVnano modules are available with either an adjustable or a fixed focus. The fixed focus is set before leaving the factory. Versions with separate optical and electronic elements are particularly space saving. One version is also available without an electronic control unit for integration in camera systems. With the line thickness simulator, you can calculate the line thicknesses and the depth of focus of our MV line lasers with different optical configurations and focal distances. Please select wavelength, power, and focus option from the pull-down menus. If you then click on the graph for either the line thickness or the depth of focus in the diagram created at the desired focal distance, a second diagram is created which displays the course of the line thickness outside the selected focal distance (beam waist). By clicking repeatedly on the first diagram, you can display the line thicknesses at further focal distances.